With this Holiday season coming up, many people are having parties with their friends and family. More often than not those people want to eat, and if any of them happen to be vegetarian, then there are a lot of veggie platters at these parties. Did you know there are some easy options to serve your guests gourmet appetizers instead of celery and carrot sticks? The Fillo Factory offers several appetizer options that are easy to bake and are vegetarian friendly. With many products that are vegan, vegetarian, organic and Kosher, The Fillo Factory can bring a gourmet and ethnic flavor to your next get-together. Products include pastry doughs, appetizers, vegetarian entrees, and yummy desserts, which are frozen and ready to bake quickly and easily. I had an opportunity to try The Fillo Factory’s Spinach & Cheese Appetizers (spanikopita) and their Brie & Raspberry Fillo Rolls. The Fillo Factory Spinach & Cheese Fillo Appetizers are triangle shaped wraps of Fillo dough that are filled with spinach, cheese, and a blend of seasoning including lemon juice, garlic, dill, parsley and black pepper. They are vegetarian and have no trans fat. 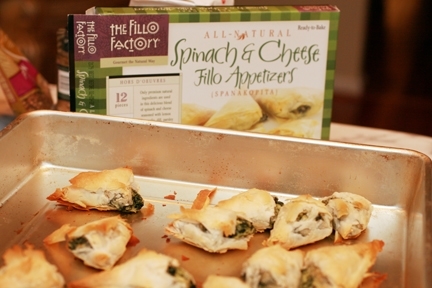 The Spinach & Cheese fillo appetizers come frozen and are kept frozen until ready for cooking. The spanikopita are supposed to cook up in 25-30 minutes but mine needed an 10 extra minutes to get that nice golden crispness to them. Since all of our ovens are different, yours may require more or less time to cook. I really liked this appetizer. 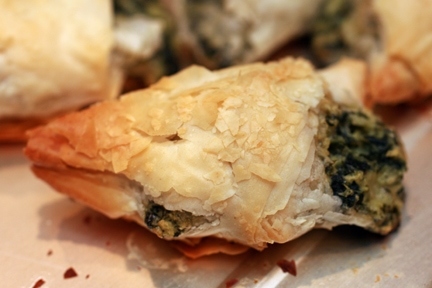 I loved the crispiness of the fillo dough and thought that the spinach and cheese flavors blended together very well. The other testers also enjoyed the flakiness of the fillo and likened it to eating a good pie crust (but not as sweet.) One also thought that the flavor was similar to a gourmet spinach dip that was wrapped in baked bread. He thought it was a clean, neat, treat. One of the nice things about the fillo dough is the crispiness, but with that come the dough flakes. Pieces of dough will break off with every bite so you will need a napkin or plate to eat these. This works out well because then you can lick up the dough crumbs when you’re done. 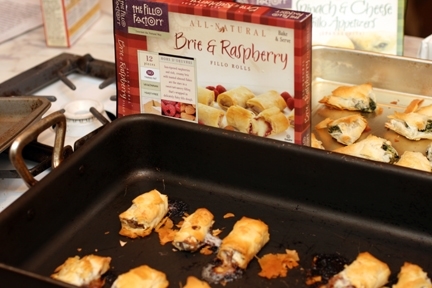 Raspberry and brie cheese are wrapped into rolls of fillo dough to create the Brie & Raspberry Fillo Rolls. There are also toasted almond flakes, but the brie & raspberry flavors are more dominant so I really didn’t notice the almonds. These hors d’oeuvres also have no trans fat, are vegetaarian, and are yeast-free. The instructed cooking time was 12-15 minutes, and again I added a little bit of extra time (5 minutes) to get the desired golden color. While the spanikopita was my favorite appetizer, the other testers preferred The Fillo Factory Brie & Raspberry Fillo Rolls. Both of them thought that the speetness of the raspberry made the roll more dessert-like than appetizer like. One thought it was like a “bite-size piece of raspberry pie covered with warm cheese.” The raspberry was really the star of this appetizer, with a strong burst of sweetness that isn’t over powering. The flavors of the brie and rapsberry in conjunction with the pastry flavor of the crust made this a realy treat to eat. I was really impressed my the quality of the end product for both of these products. When it comes to frozen food, it’s always a question to me whether they will come out crispy and not soggy, so I was really happy that The Fillo Factory has figured out how to make sure their dough cooks up crispy. I like that these are freezer ready and require no prep work other than pre-heating the oven when it comes time to cook. The flavors tasted fresh, without any hint of being frozen, and offer a convenient way to bring a gourmet flair to your appetizer table. If you would like to try The Fillo Factory products for yourself, they are available at retailers nation-wide, including BJ’s Wholesale, Whole Foods, and Trader Joe’s. They are also available for purchase online through one of their e-commerce partners. These sound really yummy…I will look for them the next time I go to TJs. Those actually look like something I would like a lot!!! 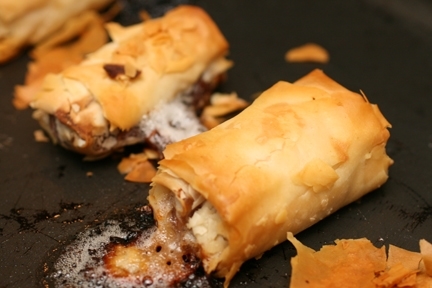 Thank you for your wonderful review of our Spanakopita and Brie & Raspberry Rolls. 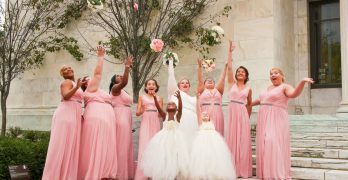 We just wanted to let you know that we just featured your review/blog on our new Facebook page! 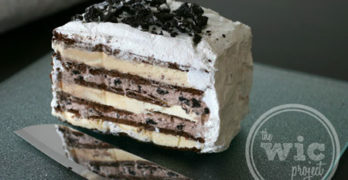 You can check it out at http://facebook.com/FilloFactory ~ we’d love for you to join the conversation.